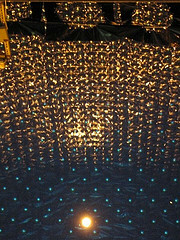 Neutrinos are the most abundant particle in the universe and yet very little is known about them. They have no charge and are at least ten millions time lighter than the electron. They see almost all matter as transparent as vacuum which makes them very difficult to study. Without the existence of large source of neutrinos like the sun, cosmic rays or man-made nuclear reactors we may have never known about them. In this lecture we’ll explain the curious properties of neutrinos, how they told us about their very own existence, about their role in the Universe, about their weight and about possible new phenomena. An elusive particle that one day, may find its way to some surprising applications. Booking is now closed but there are still places available if you come along this evening.